Update 11/26/2006: Painting is completed. I portray them as they are in real life..... much loved. Charlie seems to love them too. 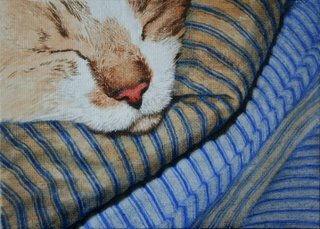 Oil painting of my cat Charlie sleeping on those vintage feather down pillows. Counting sheep again! At least he's not stealing paint brushes. This is No.3 Vintage Feather Pillow..... still in the process of completion but nearly done. It will be available for purchase in a few days. I began with a turpentine/oil wash in Ultramarine Blue to sketch the pillows and place the cat. 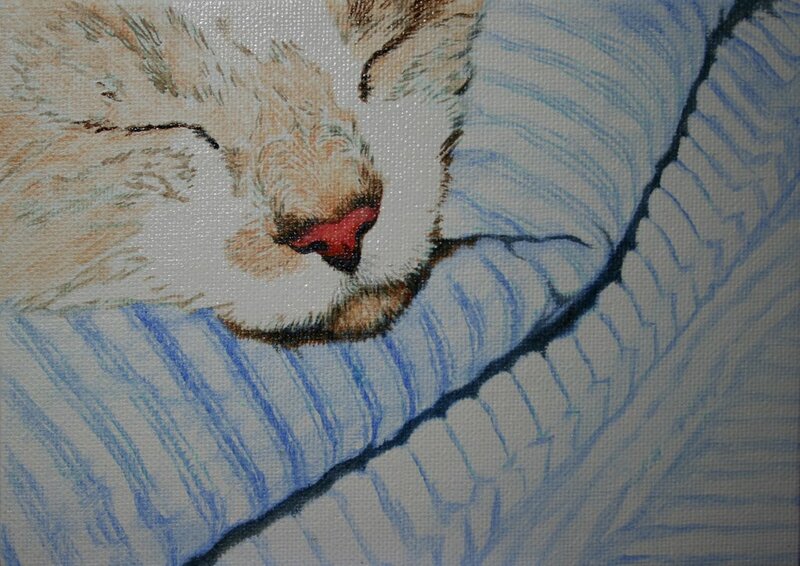 With sporatic spot tracing on the cat I established in key areas the direction of the hairs. This is my Charlie and I want it perfect! Of course I have to paint all those little hairs on...... and not to mention those pillow stripes. Since this is being painted in layers where each one must dry before another is applied.....I work on other paintings in the interim. 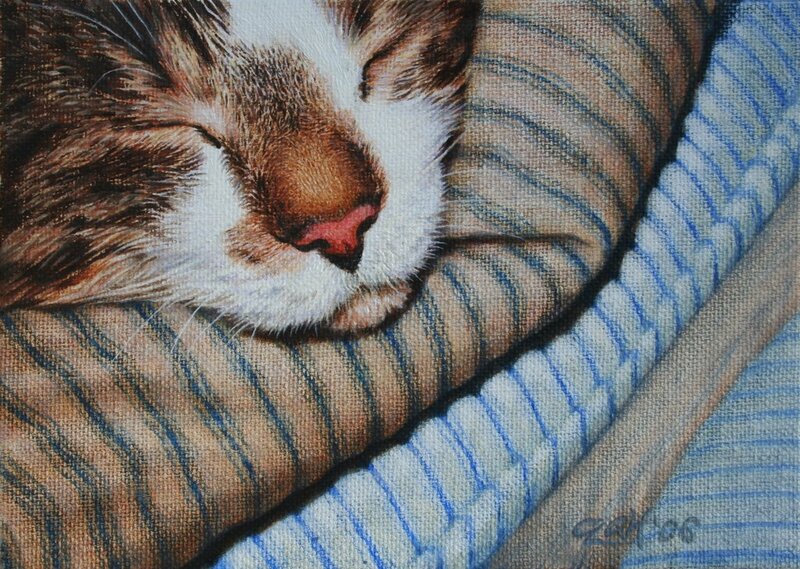 Glazing with thin washes allows the texture of the canvas to reveal an extremely realistic cloth pattern on the pillows. Now I will paint Charlie while the pillows dry in preparation for their next layer and post an update soon. I will probably do a little more touchup in a few areas and refreshing of the highlights before I post this finished painting. 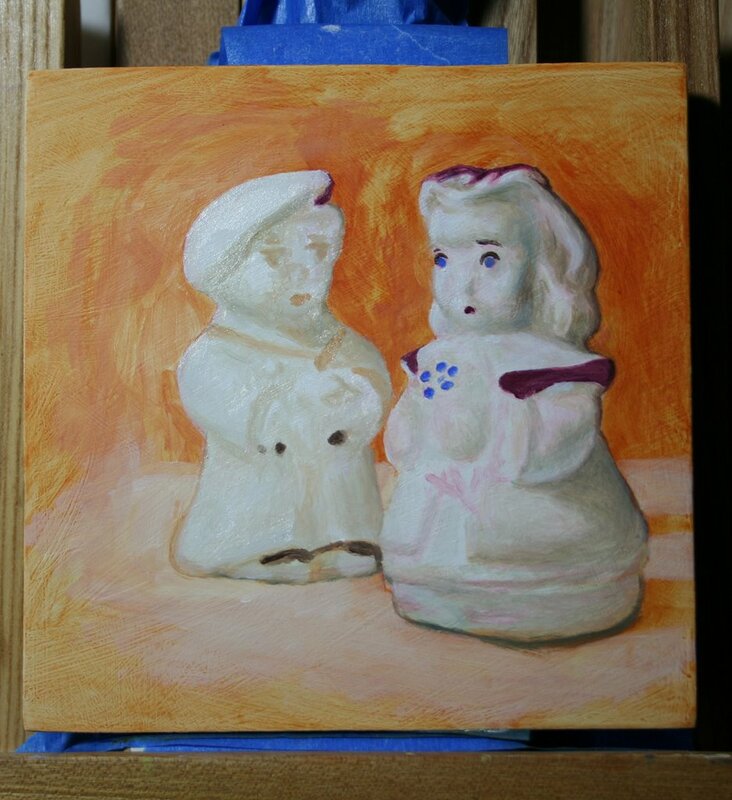 But for now I will set it aside and begin another little painting. I will be using these Salt and Pepper Shakers in a larger painting so this was a good exercise. I have really enjoyed this little painting. 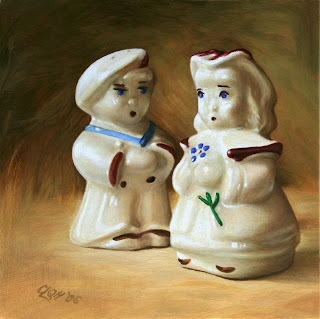 Painting Daily Oil Sketch #1 ... Shawnee Salt & Pepper Shakers ... I will discuss the oil paint colors I am using in this work still in progress. I still have more detail, color adjustments and highlight work to be done before this painting is completed but would like to share with you the colors I have used thus far. The photograph had to be taken using artificial lighting, therefore the glare, but the colors are very close to the original. The paint is still wet. 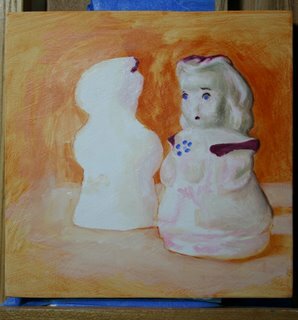 Titanium white, burnt umber, burnt sienna, brown madder, ultramarine violet, ultramarine blue, payne's gray, cadmium-barium green deep, chrome titanate yellow. All are Grumbacher Pre-Tested oils. 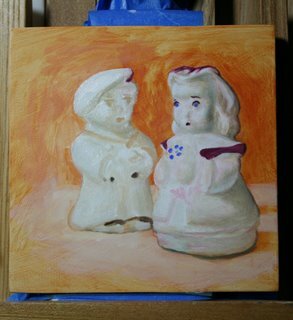 Shawnee Salt & Pepper ... Painting viewed on easel with pottery shakers still life setup. 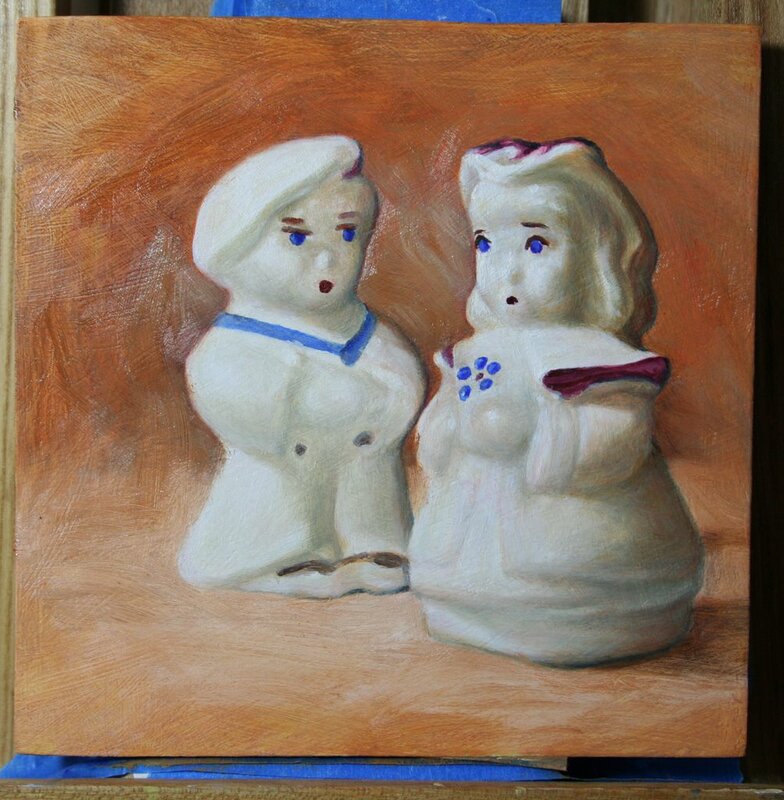 "Sailor Boy" and "Little Bo Peep" immortalized in oils. 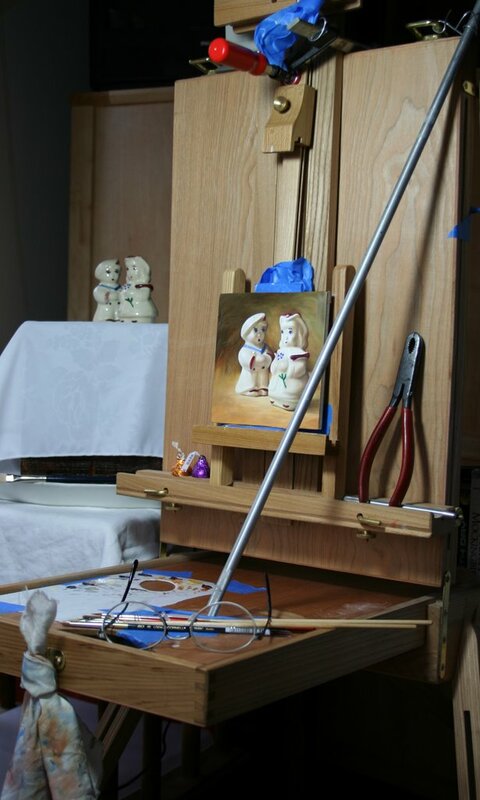 Shakers are shown in the art studio with the easel setup. The lighting and angle is different than in the actual painting...... and you can't see that they are missing their cork stoppers. 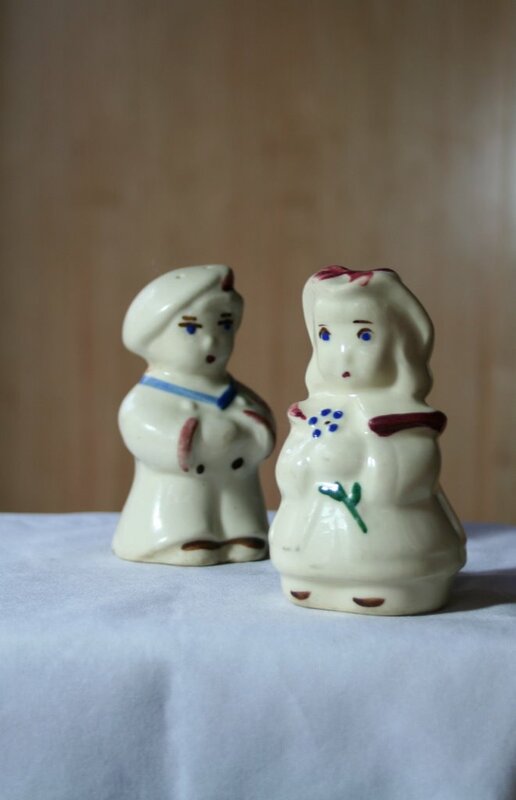 As a child I actually played with these as a special treat whenever I was ill in bed so they never "made it as shakers" but admired on the what-not shelf. Isn't it wonderful to take the ordinary and elevate it to portrait status? 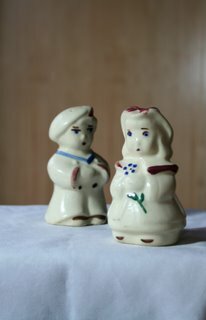 After all these are heirloom treasures though tattered with age. Before proceeding further I felt the need to tone down and begin establishing my lighting in the background using a flat stiff bristle brush. I have yet to determine what the final color will be to best support my subjects. 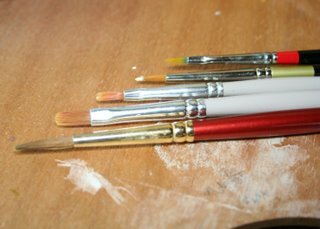 a brief word about the paint brushes I am using. 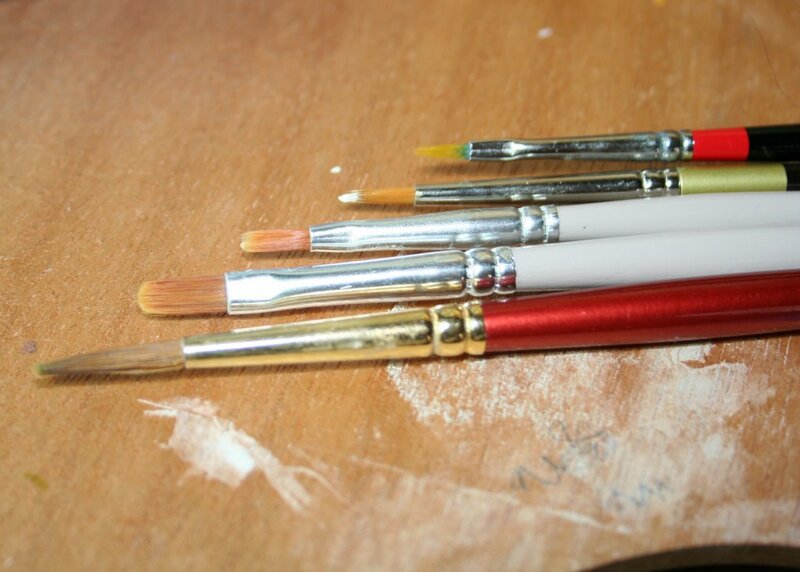 Most of the painting is done with the Windsor & Newton. Detail and some blending with the rest. I do not purchase expensive brushes for my oils but for qouache.... well that's a different story. 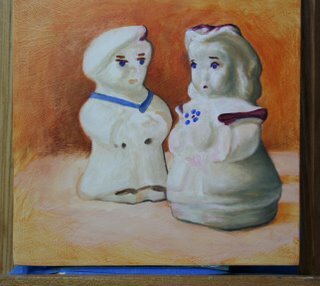 Began painting sailor boy and worked a little more on girl. 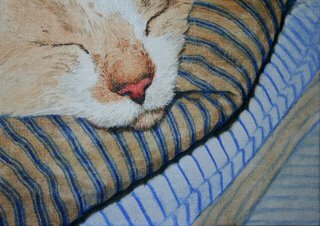 Would have loved to have come closer to completion today but my dog Maggie needed to visit the vet so I missed the bright morning light. 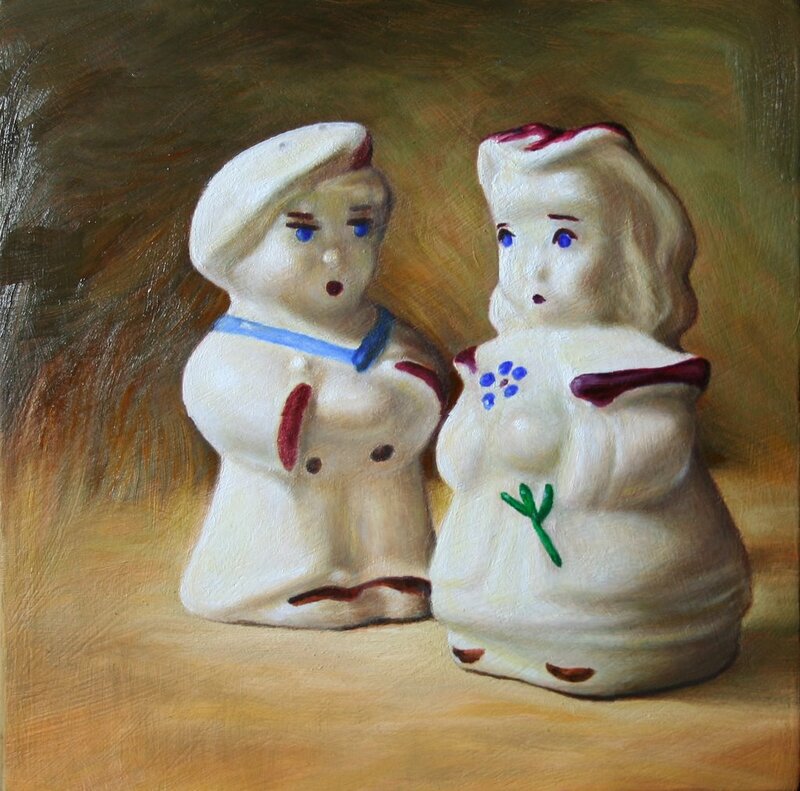 Ceramic objects have such depth of color and refraction of light due to their high gloss translucent glazes. A challenge to paint and natural daylight certainly brings out their beauty. 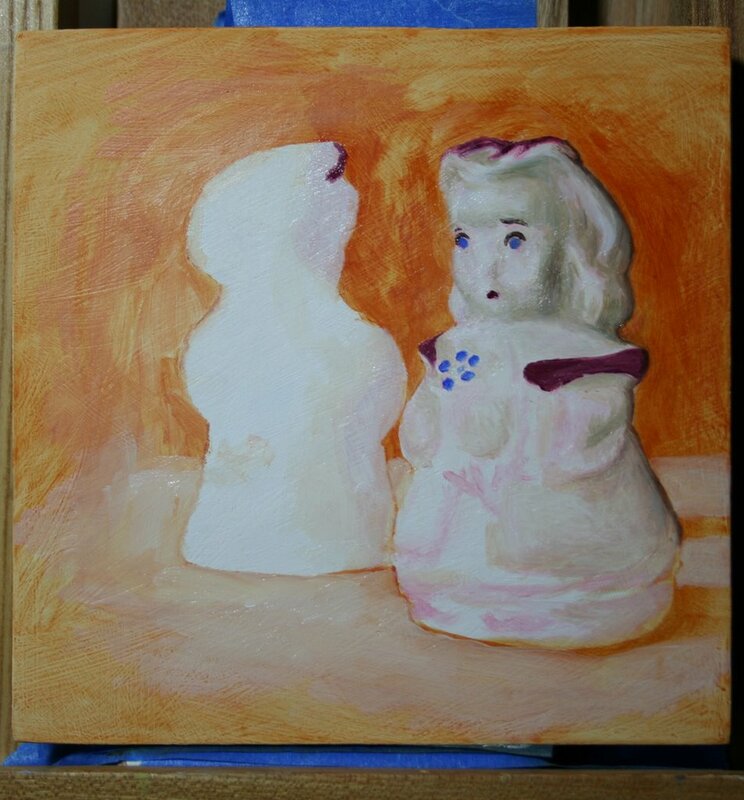 A color study for a larger painting.